Reflections and Ruminations: How can one improve as a Catholic if one hasn’t infringed any of the 10 Commandments? How can one improve as a Catholic if one hasn’t infringed any of the 10 Commandments? It is indeed a good question, and especially so if the intention is not to trip me up, but to really want to get to the heart of what being a Christian is. I say this is a ‘good’ question partly because I suspect that it is a question that exists in some nebulous form in the minds and hearts of so many Christians, both Catholics and non, but few get to articulate it in such a concise and clear way. There exists in so many of us moderns the need to be performers. I’m sure this doesn’t only apply to folk living in the First World, but generally speaking, this ‘performance principle’ is very evident in First World countries. After all, many, if not most, are running on some form of meritocracy. We are told from a very young age that we need to prove ourselves and to work hard in order to achieve ‘anything we want’. While this may have its merits in instilling a sedulous work ethic, we may easily and falsely apply this to our spiritual lives, where we forget that our salvation in Christ has nothing at all to do with merit or achievement. It is pure grace, and none of us deserves to be saved, no matter how virtuous and noble our lives may be. To think of the Christian life only in terms of a ‘performance’ of not sinning may reveal that we are missing something so intrinsic to the Christian life. What may be missing could be the most important thing, which is the love that we put into everything that we do. As a confessor, I often hear penitents admitting that they aren’t faithful to their prayer life. My next question often stumps them because I like to ask them “when you pray, do you pray with love?” I am used to getting silence as a reply, followed by “I am not sure what you mean, Father”. Our prayer life cannot just be prayer that we are reading off a prayer card or the mere mumbling of a series of phrases that we have committed to memory. If so, then we could be ‘saying’ our prayers, but we may be quite far from actually praying. Prayer is, after all, an act of loving communication with God. Love has to be the motivation for our prayer for it to be something that conveys our love for God. Love changes and transforms the words, making the link between our heart and God. And because we are so prone to distraction and having our attention pulled in 100 different directions all the time, love is then the act of the will to bring our attention to God as the object of our affection. This moving of the will has very little to do with our feelings and sentiments. In fact, love becomes purified when despite there being no feelings and sentiments and emotions, we activate our wills to love. 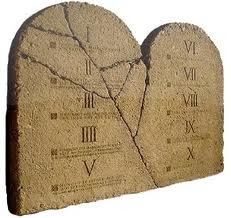 Why I am taking pains to expound a little about the need to love with our wills is precisely because our not infringing any of the Ten Commandments cannot be the only gauge we use in our lives when we are examining our spiritual lives. A much better gauge or means of self-evaluation is to ask ourselves if we have put in much or any love into our relationship with God and with our neighbour. This is concretely how we can improve in our spiritual lives despite not having transgressed the Commandments. When this becomes our checklist and spiritual KPI, we will not fall into the mistake of merely being interested in whether we have broken laws, but more importantly, whether we could have loved and lived in more Christ-like ways. This should give us plenty to bring to the confessional and at the same time, giving us a lot of indication where we can improve in living out our call to be the sons and daughters of God our Father.